NASA Earth Observatory image by Robert Simmon, using Landsat 8 data from the USGS Earth Explorer. 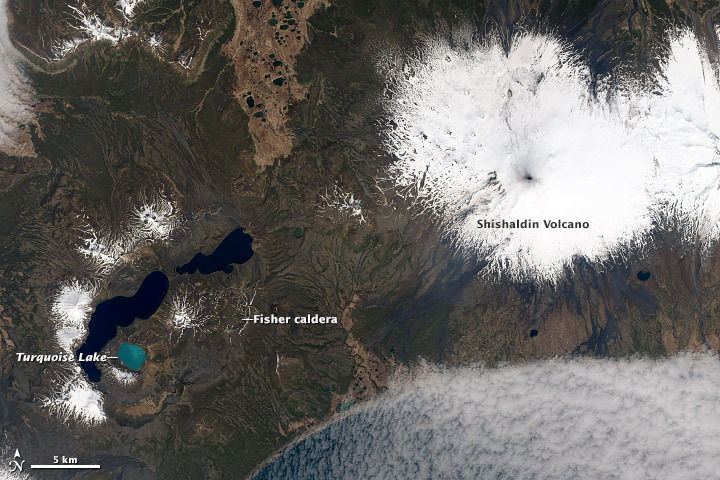 Shishaldin and Turqouise Lake (within Fisher caldera) are two restive volcanic features on Unimak Island, Alaska. Shishaldin is currently listed at a code orange alert level by the Alaska Volcano Observatory. (“Volcano is exhibiting heightened or escalating unrest with increased potential of eruption, timeframe uncertain, OR eruption is underway with no or minor volcanic-ash emissions.”) The dark spot at the volcano’s summit is fresh ash. Shifting hydrothermal plumes rising from the bottom of the Turquoise Lake stir up sediment, causing the light blue-green color. These plumes also warm the lake to 13°r;C (55°r;F), and make it acidic. (Investigators recorded a pH of 2.1 in 1990). 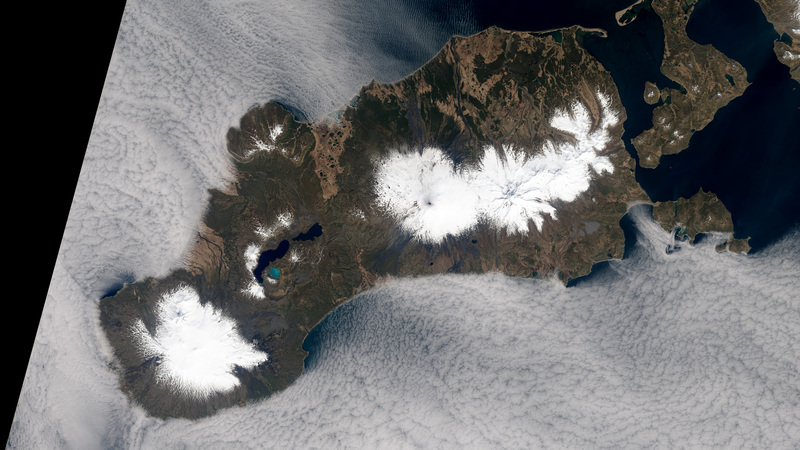 This natural-color image was collected by the Operational Land Imager aboard Landsat 8 on May 14, 2014. Stelling, P. (2005) Eruptive history of Fisher Caldera, Alaska, USA. Journal of Volcanology and Geothermal Research (139) 3–4 pp. 163–183.